Amiibo are taking over the gaming world and, pretty soon, Nintendo won’t be the only publisher invited to the party. If a recent rumor is to be believed, it looks like Yacht Club Games’ Shovel Knight will be the first third party game to earn an interactive figurine for 3DS and Wii U.
Gamespot recently got ahold of a leaked image from UK retailer ame’s Brighton, which claims that a Shovel Knight amiibo is inbound. 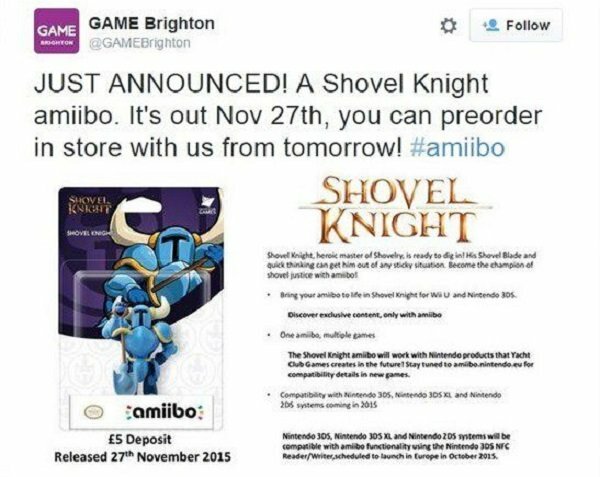 The following image first popped up on twitter, informing folks that they can get their hands on a Shovel Knight amiibo of their own starting Nov. 27. The image claims that pre-orders for the Shovel Knight amiibo begin tomorrow but, since the original tweet was originally scrapped, we’re guessing that the announcement may have gone live a bit earlier than anticipated. The announcement goes on to state that the Shovel Knight amiibo will be compatible with both the 3DS and Wii U versions of the game, which will unlock exclusive content only available with amiibo. The announcement also claims that the Spade Knight’s amiibo will be compatible with future Wii/3DS games from Yacht Club, which certainly perks up my ears. Shovel Knight was one of my favorite games of 2014 and possibly the best retro-themed game to come out since the days of the SNES. The game is a loving homage to classic gameplay and aesthetics, but it also builds on the platforming genre in new and interesting ways. I was also a fan of the fact that Shovel Knight is a genuinely entertaining throwback to games of old; clearly influenced by genre greats but never relying on referential jokes or winks at the camera. There have been other third party characters popping up as amiibo in the past, but those were all designed to go hand in hand with Nintendo’s Super Smash Bros. As it stands, Shovel Knight is the first third party character to get a figurine designed to be used in third party games. Which has gotten us thinking: Which other third party games would we like to see get amiibo support? We’d be interested in seeing your answers in the comments section below. What’s really interesting is that amiibo have been such a hit despite the fact that they are nowhere near as interactive/useful as characters in the Skylanders or Disney Infinity games. Here’s hoping Shovel Knight is the one to buck that trend.